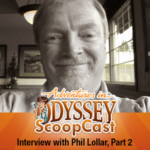 Introducing… The Odyssey ScoopCast Mini-Site! 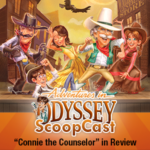 Today we’re proud to present a brand-new look to our popular podcast: The Odyssey ScoopCast. 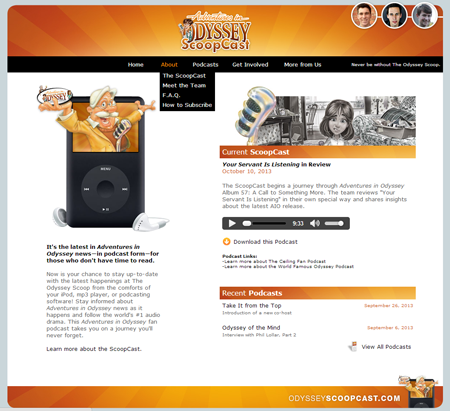 It comes with its own new domain name as well: odysseyscoopcast.com! Our new Odyssey ScoopCast website is your one-stop resource for information pertaining to The Odyssey ScoopCast. It includes a complete archive of past and current podcasts and a fresh, new design. With any new website, there is certainly room for kinks. If you come across one, feel free to contact us and point us in that direction. As always, you can still access our podcast from the Scoop navigation bar. All filenames within the site remain the same, so if you happen to see our old look when perusing the site, just do a hard refresh of the page in question.